Hi Everyone! Gee I feel like I’ve been missing in action! Well, not so, I’m here, just incredibly busy. Today is day 11 of the Stamp Simply Celebration and I’m giving away blog candy to two lucky winners. One lucky winner will receive a Countdown to Christmas Bo Bunny scrapbook kit and a new, unmounted, Stampin’ Up! sentiments stamp set entitled: “Lots of Thoughts”. Pictures of my completed album are shown below. 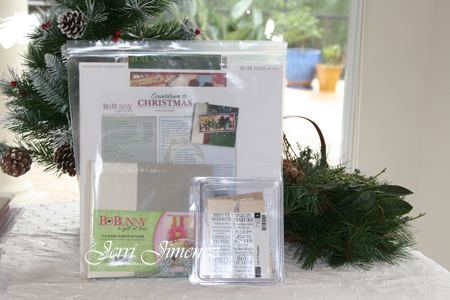 The kit consists of complete instructions, together with all materials, including a 6″ x 6″ linen and chipboard album. A second lucky winner will receive four new, unmounted, Stampin’ Up! stamp sets entitled: “Blooming with Happiness”, “Friendship Blooms”, “Oh, So Lovely”, and “So Many Scallops”. Okay ladies, here are the rules: To win this blog candy comments will work like raffle tickets. For every comment you leave on any Christmas design I’ve posted in my blog, you will be entered for a chance to win the prizes, your comment is your raffle ticket. Leave only one comment per post please, duplicates will be deleted. If you click on Christmas under Categories in the bar on the left side of my blog, or click here and all Christmas posts will appear. Please comment only on the six posts that have designs that I’ve done, including this one. You are NOT required to comment on all of them to qualify for the blog candy; however, the more Christmas posts that you leave comments on the better your chances of winning, i.e., you can have anywhere from 1 to 6 raffle tickets. I will use Random.org to choose two names from each of the six posts. Once I have the twelve names, I will then use Random.org to choose two names from the twelve finalists to determine the two lucky winners. You have until December 17, 12:00 noon (Wednesday) to post your comments. I will announce the lucky winners on the morning of December 18. Every year I take a lot of pictures at Christmas and never seem to find the time to scrapbook them. I’m very challenged at scrapbooking and that’s why I absolutely love the Bo Bunny kits. I adore the Countdown to Christmas kit, it was super fast and easy to put together. I’ve made one and embellished it a bit more than what is in the kit. I’m showing the entire scrapbook album and the pages so that you can see my “more is more” version. I’m all set to go, I’ll fill it with my Christmas photos the week following Christmas when everyone is busy playing with their new “toys”. Album cover and back. The zig zag stitching is Kaiser rub ons. Inside covers, front and back and the front page of the album. I’ve added brads, the little Christmas tree and some brass hardware. Each page will be filled with pictures of the 10 things I love about Christmas. Pages 1 and 2: I have changed the designs a bit from what is in the kit and have added brass hardware. Pages 3 and 4 are so adorable! I used a quickie glue pen to draw on the holly leaves, ornament, and gingerbread man and added glitter. I used SU’s mat pack to create the faux stitching on the large circle and photo corner on page 4. I added a lot of extras to pages 5 and 6. I love the stars, I entwined gold cord around the largest one and added glitter to the embellishments. I added the oranments, ribbons, stars, and a boot to pages 7 and 8. Again, I didn’t exactly follow the instructions that came with the kit, most of the layouts have been altered. I added faux stitching and glitter. I like to take these kits and do a “more is more” version. Pages 9 and 10 were fun to make, I can’t wait to fill these pages with photos of my family. The final page wraps up the scrapbook. 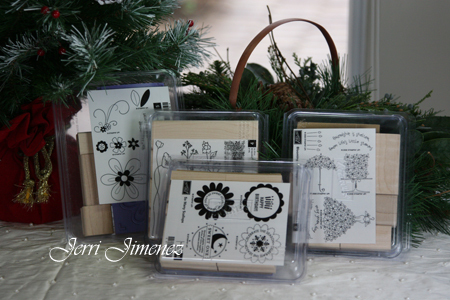 AJ Otto – The Willow Garden – Are you wrapping gifts yet? Probably! I’ll bet you need some pretty tags to dress those packages up — well, be sure to check in on AJ’s Featured Project today to see all her gift tags. And then play AJ’s challenge so you, too, can have some nice gift tags on hand!!! Be sure to stop in at AJ’s today! I love the idea of making gift tags. Below are tags I designed for gifts for my girlfriends, showing both a close up and a group shot of them. 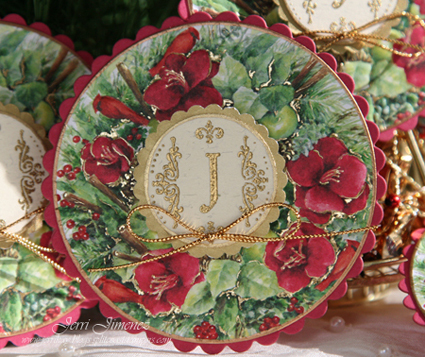 I was shopping the other day and came across a box of notecards that had a beautiful wreath on the cards. I bought them, came home and cut the wreaths out using a circle nestibilities. I used my JustRite stamper and embossed the monogram in gold using Gold Encore ink. I used a refill bottle of Encor ink and placed it in the JustRite Small 1-Reversible Ink Pad. I cut the gold and Rose Red scallops using the petite scalloped nestibilties. I drew around the edge of the monogram and wreath with a pale gold Krylon pen. I tied gold cord bows and adhered to the front of the tags. A super simple project that didn’t take long at all. It’s hard to see in the picture, one of the tags is adhered to a Gold Christmas tree filled with chocolates. There’s a larger gold bow and red ornament at the top of the tree. You can see more tag samples by checking out the blogs of: Heather, Janine, LeAnne, and Sharon. Deb Saaranen of Dream in Color is also offering Blog Candy for us today! Well, WHERE do I begin? OH my goodness!!! Those tags that you say were simple just took my breath away, truly!!! They are stunning!!! And your scrapbook – oh my goodness — how fun and cute is that!!! You do amazing work – WHATEVER you do!!! Thanks so much for sharing all this with us and good luck to the lucky candy winner — don’t count me, but I just HAD to comment!!! Wowza! Your work never ceases to amaze me–so elegant! These tags are just beautiful! As usual!! TFS…. Oh, yeah, don’t count me either for the blog candy, but just had to comment on HOW WONDERFUL IT IS!!! Wow! I just found your blog from the Stamp Simply Creates blog. I love love love your Homespun Holidays Album. I can’t wait to peruse the rest of your blog but had to say hello first. I just stumbled across your blog and may I tell you, what a treat I’m in for as I search it. Thanks for the chance to win some great blog candy. These tags will make great additions to any Christmas gift. I like the traditional patterns and colors. Great pages! Thanks for sharing! Wow, these tags are gorgeous as well as the scrap pages! I’m loving it all! I’m swooning again! I get faint every time I visit you. What a fabulous scrapbook, Jerri! Wow! And the tags–gorgeous! What a great idea to use the cards. I’ll bet they weren’t nearly as pretty in their original state. Thanks for sharing your art, and thanks, too, for the wonderful candy offer! Gorgeous work! Oh my goodness, the colors and embossing on all your designs just look so rich and elegant. Thank you so much for starting your blog and sharing your work! Also, thanks for the chance at blog candy too!! Those tags are absolutely beautiful! Thanks for sharing them! I’m off to see your other Christmas posts! Jerri, I love the gift tag idea! They are so pretty and I know your friends will love them and the personal touch w/your gifts. The scrapbook is so cool and I love it…you say you are not talented w/scrapping, well…I totally disagree, gf! It puts me to shame and I have been scrapping alot longer than stamping. These are amazing!!! I’ve got the exact same pattern paper of green, red and blue, and have been holding on them for too long. You gave me such a great idea. Thanks for the chance to get some free candy, will be leaving my comments as required. I’m soooo excited!!! Have a great Festive Season. Andy! WOW! The scrapbook pages are just wonderful!! So bright and cheery and perfect!! How on earth can you GIVE AWAY those tags? They are just gorgeous. What fabulous work you do – every single time! Thanks so much for sharing all of your stunning artwork! WOW! These have got to be some of the most beautiful tags EVER, Jerri. Scrumptious. Truly, truly scrumptious! The bo bunny album is so adorable. I love the additions you made to make it your own….it looks great. Your tags are fabulous too! Awesome job. I LOVE that scrapbook album! We’re trying to teach our daughter that Christmas is about more than Santa and presents, I think we’ll try to do something similar for her. i love this little binder. very cute. Those tags are truly beautiful. I’ve never seen any as pretty. What lucky friends you have getting those beautiful tags. Thanks for the chance to win such great prizes! Your album is wonderful too! What a great album and beautiful tags ! Would love to win one of those prizes ! You make that scrapbooking look so easy!!! As for those tags, your origin makes me start to think laterally!!! You have such a magic touch, Jerri. Everything you make turns out gorgeous. I love both the album and the tags. The tags were an easy project, but one I would have never come up with and they’re so elegant. Thank you for offering the yummy blog candy. Oh my goodness Jerri, I swoon every time I look at the pictures on your blog!! I simply don’t know where to start – everything is so fabulous!!! The scrapbook pages, the tags, I could go on and on. You are one amazing lady!! LOVE the idea of the cards for tags, Of course adding your touch makes them stunning!! They look fabulous! And what a special book to house all those treasured holiday memories! Just wonderful Jerri! These are exquisite! I LOVE those tags and that scrap book is wonderful! I am so in awe of your work! I love the tags and the scrapbook . It is truly beautiful. Wow – your album is so adorable!! I love it….it looks great. Your tags are fabulous too! Thanks for sharing. Great scrapbook and over the top tags. Amazing work. Great scrapbook! Your tags are gorgeous! I’m such a copycat and I plan to attempt to make some tags like yours. They are really pretty and I just know my friends will be surprised if I make anything. Love your ideas. Love the scrapbook pages and the give away is so generous! hope to win! 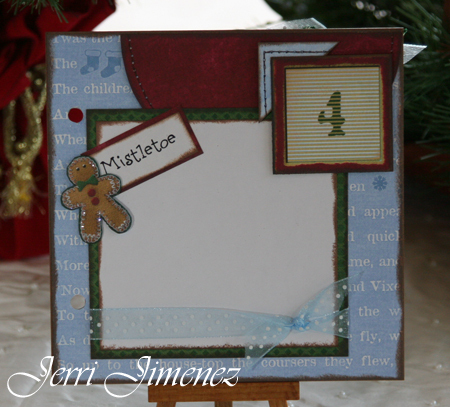 Wow Jerri, your album is adorable and I absolutely love your christmas tags! Great job! I love that scrapbook! Great papers and layouts. The tags are awesome, too! Your tags are stunning as is the rest of your work. I’m sure the recipients of your tags will love them. Those tags are beautiful–and what a clever idea to cut the design out of Christmas cards! Wowza holiday album and tags (which would make great ornaments too!) – TFS, and thanx for the t’riffic blog candy opp! I LOVE~LOVE this scrapbook album!!! I just wish I had thought it of it years ago myself to have one for each year…pricesless! I might have to make one myself for this year at least! The tags are awesome…..I never throw my Christmas cards I receive away and recyle them into tags…..but these are jsut awesome, and I never would of thought to use the nesties to cut them out with…very smart, indeed! Thanks for the chance to win the awesome Stampin’Up! Blog candy…wow…what a fun candy!!! What a beautiful album! You just gave yn idea for my mum’s present. I’m usually at lost with her, she “doesn’t need anything”. Who said anything about needing, right? Thanks for the chance with the blog candy!! My goodness, your work is amazing and just so pretty! Thanks for the opportunity to win some fabulous blog candy! Jerri!! What a great idea for your tags… I love it!! Beautiful job on your scrapbook too. 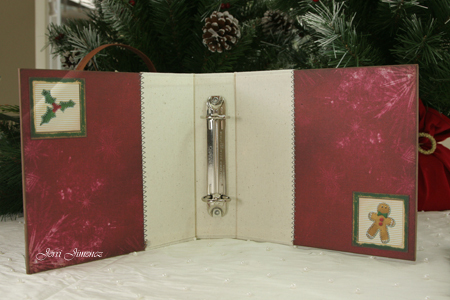 You are certainly prepared with a beautiful scrapbook for the holidays! Thanks for the chance to win blog candy. You can come and scrapbook for me anytime! WOW – mine should look as good 🙂 And for the tags, they are amazing! I would be hard pressed to ever toss one of those works of art. Thanks for sharing! OMGosh girl … how awesome is that scrapbook … AMAZING & BEAUTIFUL!! (don’t count me in the count) Just wanted to comment on your beautiful work. Those circular tags are adorable and I’m sure won’t be tossed with the wrapping paper & ribbon!!! What beautiful keepsakes!!! This scrapbook is fabulous and so inspiring. I love the colors and the layouts you used. WoW this is a creative way to have a chance at this sweet candy. Thanks for a chance. These tags are very nice! Thanks for a chance to win! Jerri I absolutely love all your work. These are the most beautiful tags I have ever seen. The scrapbook is fabulous too. I really like the gift tag idea..since I am done for this year it will go into my folder for a first for next year. Love the Bo Bunny album and the tags are keepsakes. You always think of such creative ways of using what you find. You brain must be always working creatively. Thank you for two awesome projects. Love both of them. I think I will need to order the Bo Bunny kit. Happy Holidays. This is fantastic, don’t know where you come up with all these neat ideas. Great!!!!! Awesome album! Love the gift tags too! Thanks for the chance to win! Great Christmas album – love the idea about having it done ahead of time. Wow Jerri. I don`t know where to start. First off I love your tags. What a great idea. Secondly what a fantastic amount of blog candy. And last but not least, unless I missed a post I have already commented on all your work but since it is so great, its worth another check. These are all so cute! Of course, I love the “J” tags, hmmm…I wonder why???? LOL! I stumbled on your blog today, looking up Christmas tags! I am so glad I did. What great ideas! Also, what a great giveaway! Good luck to all of your readers! You are quite the creative lady. Love you tags! I just found your blog and I’m hooked. I love how you repurposed those store-bought notecards to make them something truly special! Wow, what a great scrapbook project-love the holly dp. The wreath tags you made are beautiful-creative you!! Please do not enter me in your drawing….but I just wanted to say that your pages look incredible, Jerri!! I LOVE your wreath tags as well! Gorgeous, gorgeous!! 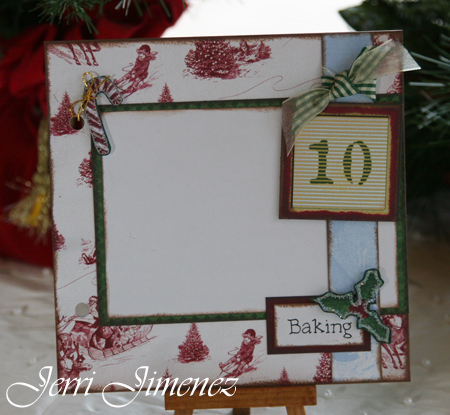 Christmas designs are the most fun to create- I think- and yours are beyond gorgeous! I’m a great fan of classic and elegant and I am tickled to see you are, too. Thanks for the many inspiring designs! 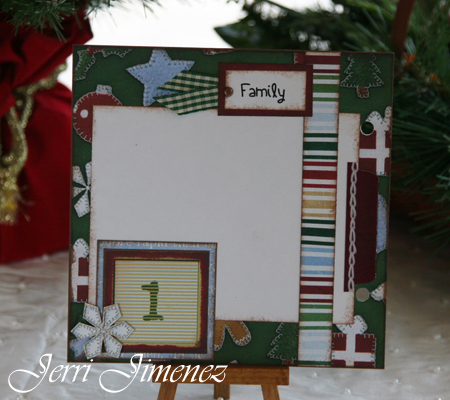 These tags are gorgeous – I make mine so simple for the Holidays in comparison. That album is fabulous! Jerri, Love the album and the tags are so cute! Thanks for sharing your wonderful talent with us. I learn a lot from you. Just love those beautiful tags! The scrapbook is a great idea, too. And the blog candy, very generous of you. Lovely job on the SB pages! One day I’ll have to get into SB. Tags are a wonderful idea too. Thanks for the chance to win as well. This has been quite the celebration! Wow! This is absolutely fabulous! I’ll definately be casing this one! I love the concept and the colors/papers. Just wonderful. My Favorite for sure! this is one fabulous project and I LOVE it!! 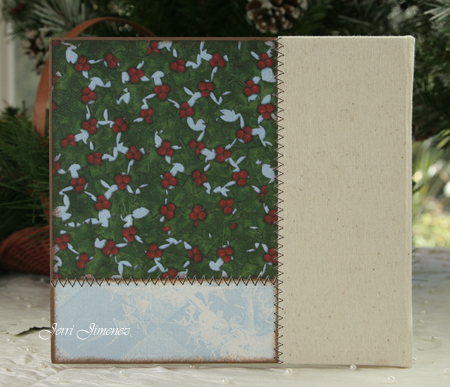 The little book is a perfect way to capture holiday memories of loved ones and it’s small size makes it easy to share. The tags are just stunning too! Last year I decided to make a little scrapbook of all those picture cards I get in the mail at Christmas, so it will be fun to see how everyone grows and changes through the years! I find that I actually prefer these smaller books over the large scrapbooks for the ease in not only storing, but sharing with friends and family. Your tags are so elegant; I love them! You tags so inspire me! I am having a great time making cute tags this year with all the new tools I’ve bought. So much fun! I love your scapbook, I like the idea of the 10 reason. And your tags are so adorable I’m sure they are going to look great on the gift. What a great album idea! I scrap all my Christmas photos in a special album that is a blast to look through at the holidays. It’s fun to see how people change from one year to the next in one book. I love this idea though and think I’ll have to CASE it! Your gift tags are beautiful! I just love JRS. The album is very nice too. A 6×6 is not easy to make. Thanks for the chance to win such generous candy. wow… these are gorgeous projects that you have done! Awesome candy too by the way! 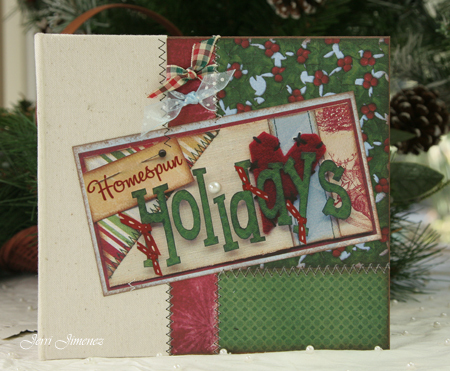 I’m LOVING these Stamp Simply Celebration Projects!!! Off to look at the rest of your Christmas stuff! Love the Christmas book. That might inspire me to get some scrapbooking done. Also, love your tags. They are so pretty. Wow, your Christmas album is gorgeous and just like all your cards – elegant!!! I can’t believe your tags, they’re so beautiful! Your blog candy offering is awesome!!! Thank you for the chance to win it! Wow! I love the little scrapbook. Gorgeous pages! And the tags? Oh my!! This is a wonderfully designed album. My sister-in-law is coming up from Texas for Christmas and wants to learn how to scrap – this would be a perfect starter kit to pass on to her. That little Christmas album if so cute and would make a wonderful gift. I also love what you did on the gift cards you designed. Thanks for a chance at blog candy. What a cute little album. This would be a great way to teach someone who is just starting out with their scrapbooking. Thanks for another chance at blog candy. Oh MY! What a wonderful kit. Of course it’s how YOU put it together too. I so dislike Scrapbooking because I get stuck for ideas. This would be marvelous. Thanks for the opportunity to win it! 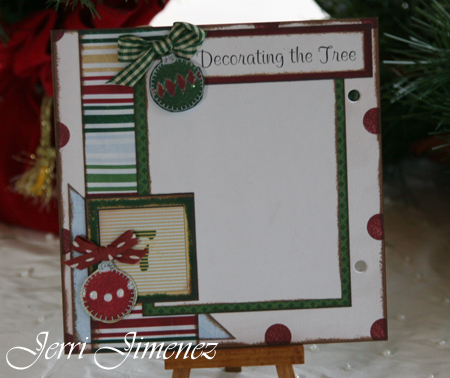 What a great theme for a Christmas scrapbook. Thanks for sharing it. What gorgeous tags. I don’t scrapbook, but your pages are delightful. Makes me want to think about starting a different hobby. Thanks so much for offering the two prizes. Both are wonderful. I love the idea of the album. Although we each know what is special about the holidays for ourselves, it is nice to be able to “document” for others, especially our children, what the holidays really mean to us. I recently bought the nestabilities circles and scallop circles to do monogram notecards as gifts. The tags are another wonderful idea using these which I did not think of. What a wonderful, thoughtful gift for someone. Jerri your projects are wonderful TFS. Thank you for giving me the chance to win some great blog candy. Have a wonderful day. Simply gorgeous tags, you are a very talented lady!!! Love, love , love the scrapbook pages from front to back! The colors are wonderful, TFS! Jerri, Love the scrapbook. A great way to remember the Family and Holidays! Hope I win! Thanks for the opportunity to win some blog candy! Wow! these are awesome projects! Love the scrapbook. So pretty. I love the ‘homespun’ quilted look of your samples, looks great! Love those tags! Just gorgeous…like all your stuff is. Thanks for the chance to win some wonderful candy! As a seriously challenged scrapbooker, I LOVE your deceptively simple scrapbook. I wish my mind would bend that way. The tags are wonderful. I’m gratified that something to beautiful began so simply. These wonderful postings have turned my eye to re-use/recycle possibilities. Thanks! Ohhhhh, I love the monogrammed gift tags! I really have to look into some JustRite products! Very pretty pages too. Thanks for sharing! The gift tags are as usual very elegant and I really like the pages you have designed in the scrapbook. I love those bo bunny kits–great album!! I just love the scrap book, Jerri….ya know, I have never scrapped before!! After seeing you wonderful scrapbook, I am going to get one of those kits and get busy!!! 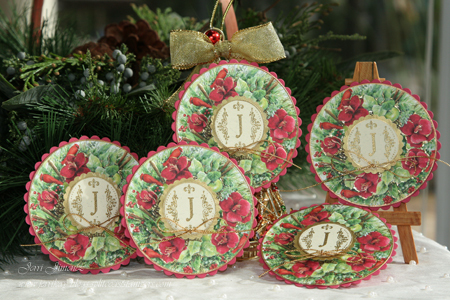 Your Christmas tags are gorgeous, too…what a super cool idea to use the note cards!!! Fantastic album and those tags are beautiful! Hmm, I may need to get some of those scrapbook kits. I too have tons of pics but never get around to putting them in a scrapbook. Those tags are stunning too. I would never have thought to buy cards to use as tags with the nesties/justrite stampers. I just love the scrapbook and the tags are so beautiful. What a great idea. I am just starting to get into scrapbooking and find it quite overwhelming. Your samples make it look a little less intimidating. Thanks for the inspiration. Wow – your gift tags are gorgeous. If one were to come my way, it would go right on my tree as an ornament, and be treasured for years to come. Love the scrapbook too – it might just be inspiration enough for me to get busy with all my Christmas photos (past and soon to be taken!). I really like the circle tags…very impressive! Please enter me for a chance to win. Your tags are simply amazing! Just beautiful. Wow! I’m impressed that you have an album done before you have even taken pictures. It’s kind of a neat idea though because then when you are taking pictures you can be thinking about what photos you want for the pages you have put in the album. hmmmm…. I love the scrapbook!!! I’ve been making tags and even using them in/on my cards. Thanks for such great ideas — and for letting us play along. My gosh these are just so special. What a great idea. Love your stuff. p.s. I forgot to say how much I woul love to have that BoBunny set and of course anythinng else would be a great bonus.!!! Wow! I love that albu. THat album is great!! I love everything about it!!!! Oh dear …love all that you do and I probably have commented on all your beautiful Christmas creations, as usual you have out done yourself again with your Home Spun Holidays…a true delight!. Ty for sharing. Wow – you are super talented! I just love those tags – they are what jumped out at me. The scrapbook is lovely too – what a great way to preserve the memories! Found you on SCS and simply had to get a better look at those beautiful tags! What a super idea to make your Christmas album up ahead of time! Even I would be able to handle putting the photos in after the holidays! What a great gift idea this would be for my non-scrapping sisters. Those gift tags are so beautiful, it’s hard to believe you just started with notecards! So simple and yet so perfect! What a treasure that album would be for any family and a magnificant holiday gift. The tags are wonderful as well. Thanks for sharing your work with us and for the chance for goodies. I love your album idea and am going to try it this year. I find that having to come up with all my layouts from scratch after the holidays is just overwhelming. Your pages are simple but catch all the must-have events of the season. Thanks so much for giving us the chance for this awesome prize! Your scrapbbok is absolutely amazing! The tags are beautiful too. Thanks for the chance to win great candy and for joining the party. Great pages! The rubon stitches look very real! I might have to get some of those. I love those tags! I have got to copy those somehow! Absolutely beautiful! Thanks so much for the wonderful idea — and the chance to win. WOW what an incredibly beautiful albumn. And WOW again – what incredible blog candy. I just adore your work! What a great idea for Christmas memories. Jerri, I love the Christmas album you’ve done. What an amazing memory album! Gorgeous tags – your girlfriends are going to love them. WOW what a gorgeous project! Your album is fabulous. Very nice tags also. Thanks for a chance to win. Oh wow, you’ll have so much fun putting your pics that scrapbook! It’s awesome! I also love those tags- you have a steadier hand than I do when it comes to outlining with those paint pens! You rock! You do such beautiful work, it’s amazing. What a great idea, you’re full of inspiration. Okay, I LOVE your Christmas Countdown book, that is such a cute idea…wish I would have thought of something like that and made it 🙂 I really like it, it is going in my Christmas Idea Book, as a project for next year. Your scrapbook and tags are both INCREDIBLE!! I’m generally glad just to complete about 60 cards for Christmas much less make the tags as well! I have a Just-Rite monogram stamper so there’s no excuse for me to not CASE your gorgeous tags! I’m so glad I came across your blog – I love every one of your cards – you are so talented. Thank you for sharing your techniques and ideas. I love the tags and the scrapbook pages would make a perfect gift for my aunt next year – thank you so much for the idea. Thank you for the opportunity to win such great blog candy. The wreath tags are incredible. Those tags could be cards! The monogram makes it extra special too! I love the scrapbook pages. What a wonderful idea! I’m inspired to do this next year for our family Christmas. The tags are beautiful but not sure I have enough patience to take on a task like this. Thanks for the gift of your blog candy. Your tags are just gorgeous! Thank you for the chance at your wonderful Blog Candy! the scrapbook pages are beautiful but I am totally in love with the tags!! hehehe I might have to case some and then change all the tags on my gifts! Amazing! Your gift tags are truly amazing! I would be afraid to use them because I think they need to be framed. Love them! What an adorable scrapbook – you are not scrapbook challenged by any means! I have loads of Christmas pictures and always start scrapbooking them, but never seem to get finished! I just love how you’ve prepared the pages ahead of time. And your tags are scrumptious. All of the layers and the gold, they are simply regal. I love this idea!!! You did an awesome job on it!! !Thanks for sharing!! love them-what a great idea! Your tags are pheonominal! They’d take me days…LOL! Thanks for the great blog candies! Happy Holidays!! Scrapbooking is new to me but looking at your many lovely layouts and ideas tells me I shouldn’t wait to begin. It would be a great starting gift indeed to win your stamp sets! Merry Christmas to all! Fancy Schmancy tags! So pretty and I really love that you used the nestibilities for that added touch! Go you!! Wonderful Gift Tags, so very elegant. All I can say is “WOW”. I love the scrapbook and the designs you made – great job!! I also love the gift tags, I had not thought of that, what a neat way to use one item and turn it into something so wonderful. I see where these nestabilities are a handy tool, I will need to get me a set or two someday.